FOR John Wilson it was supposed to represent an investment. Seven off-plan apartments in a complex in the scenic mountains of Granada that – once built – he could sell on for profit. But for him, it has turned into a nightmare. The apparent loss of 300,000 euros has forced him to the point of suicide. A symbol of ineptitude or a symbol of human greed, the fiasco that is the Zoco complex has been well-documented in the Olive Press. As reported in issues 38 and 39, no work has been done on phase four of the complex since last March. Another part of the development, which sits above the hamlet of El Golco in La Alpujarra, is mostly finished but has no electricity or sewerage over doubts over its legality. Despite deposits being paid to the UK companies marketing the development – Palmera Properties, Ideal Spain and Mediterraneo Estates among others – people have little chance of seeing their missing money returned. The anger and frustration at his financial loss finally boiled over for Wilson, 45. Beaten and defeated, he had decided to commit suicide. The Olive Press had received advanced warnings as to his intentions. In an email sent in mid-February, the engineer from Southend on Sea had promised something “newsworthy and visually spectacular.” Our interests stoked, we were soon in touch with him to discover more. “I am going to starve myself to death,” he eventually said over the telephone after we had called the number included in the email. Wilson was initially reluctant to give the us any details as to why but, when pressed, the extent of his financial loss was difficult to comprehend. He claimed to have paid 300,000 euros to Mediterraneo Estates for seven properties in the troubled complex. That was in April 2004 after he saw an advertisement for the Zoco development in the UK national press. He sold his terraced home in East Ham in London to fund the deposits for the apartments he had hoped to sell on for a profit. Like many others, he was told it would be completed in 2006. That date came and went. Today it is a derelict site, more a ghost town than the luxury development buyers were promised. It was not a hoax, he was serious. We met on a bright early March morning at the unfinished phase 4 of the complex. He seemed agitated, nervous when I asked him why he was making this ultimate protest. He told me how he had spent years trying to obtain information first about the delay in completion, and then the unfinished state of Zoco. When it became apparent he would never see his seven apartments, he tried to have his money returned. From a battered sky blue suitcase he brought out the paraphernalia seen in the photographs. With clothes pegs, he hung the banners onto the mesh fence, erected to keep intruders out of the building site. 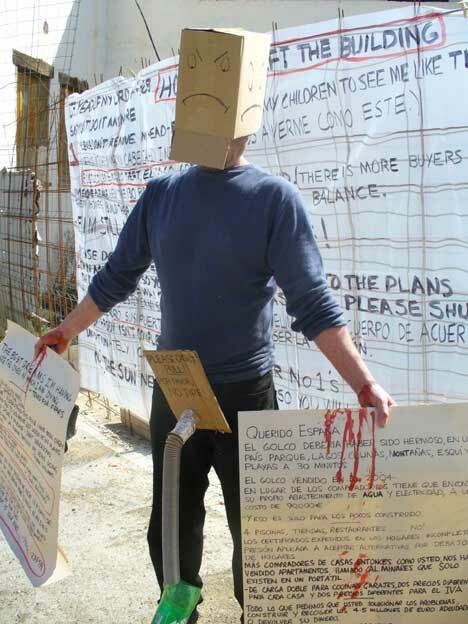 On the banners, he had written his last will and testament in which he asked for part of his missing money to be used to help those in a similar situation – after paying thousands of euros for their dream home in the south of Spain, they have apparently been left with nothing. 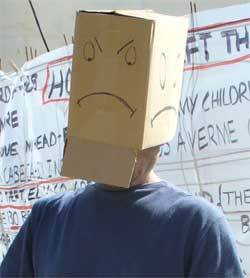 He placed a cardboard box over his head “because I don’t want you to take photographs of my face,” and inserted into his trousers a crude home-made device; its intended function obvious. With the battery on his mobile phone running low, Wilson and I made arrangements for the Olive Press to call him at specific times. The first allotted phone call after our face-to-face meeting was Monday at noon. “I have changed my plans,” he said. Thinking he had decided to call off the tragic protest, I could not have been more wrong. Shocked, I cannot recall what I said in response. After putting the phone down, I knew what I had to do. The Guardia Civil, the force that polices rural areas of Spain, could not believe what I had told them. Nor could Win O’Sullivan, his partner, who was also in clear disbelief. The rest of the day was spent on the phone to both Win and the emergency services. The police asked me to repeat all that I knew about the would-be suicide: Was he a friend? Why did he get in contact with the Olive Press? How was he planning on taking his own life? Win told me that Wilson’s mood had become darker and darker over the past few years, and he had received treatment for depression over the sorry affair. The following morning, I telephoned the police to discover if they had managed to track him down. They had not, but would continue their search. Shortly before 10am, I received a text: Saw police, it read. Although he planned to take his life in one of his apartments, Wilson had been sleeping rough in freezing temperatures in the mountains. It was clear that as he made his way down to El Golco, he had spotted the civil guards who were waiting for him. Thirty minutes or so later, Wilson called the Olive Press from a public phone. Not knowing what to do, or knowing the area, he said he was in a town. Deducing he meant Cadiar, I told him it was I who had called the police. I added that his partner – who had not slept since discovering Wilson’s intentions – was worried sick. “Do you not think you are admitting defeat by doing this? What about your children? Who is going to deal with heartache of flying your body home?” Subtle it was not, but it seemed to work. Over the duration of two more phone calls, Wilson was convinced to return to his family in England and regain some normality in his life. The Olive Press has given John Wilson and Win O’Sullivan contact details for the Costa del Sol Action Group, which organises legal action for those who have lost money on property in Spain. MANY bought apartments at the Zoco complex through companies such as Palmera Properties (see issue 37), Ideal Spain and, like John Wilson, Mediterraneo Estates. The three are in some way linked. As well as marketing property on the troubled development, all have had bases at one time or another in Southend on Sea in the south of England. But the link between Ideal Spain – a company whose directors apparently fled with thousands of euros of people’s money in missing deposits – and Mediterraneo Estates runs deeper. As reported in the Olive Press (issue 38), Neil Burrows placed a deposit of 16,000 euros with Ideal Spain on property in the unfinished phase at El Golco. Almost immediately, he claims, he was “suspiciously” informed that the company was no longer dealing with that development. Instead, he would be completing on the one-bedroom apartment with Mediterraneo Estates. That was in February 2004. Four years later, what was to be his dream holiday home is still incomplete. “I thought it suspicious that I was fobbed off in this way. Four years down the line, the apartment looks as if it will never be built. I fear I have lost everything,” the engineer from the West Midlands said. In documents seen by the Olive Press, Kevin van der Vos – once of Ideal Spain – was director and company secretary of Mediterraneo Estates until he resigned in April 2004. Raymond Bates who ran Mediterraneo Estates until the company ceased trading on January 15, 2008, refused to answer the telephone when called at his Essex home. 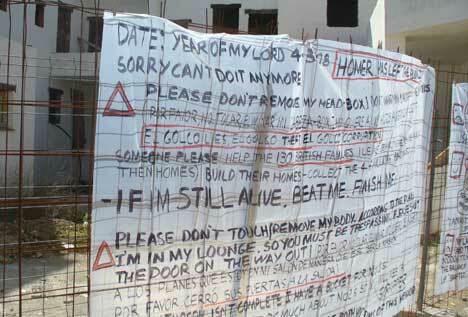 AS long ago as 2004, buyers at the Zoco complex were warned they could fall victim to a possible fraud. 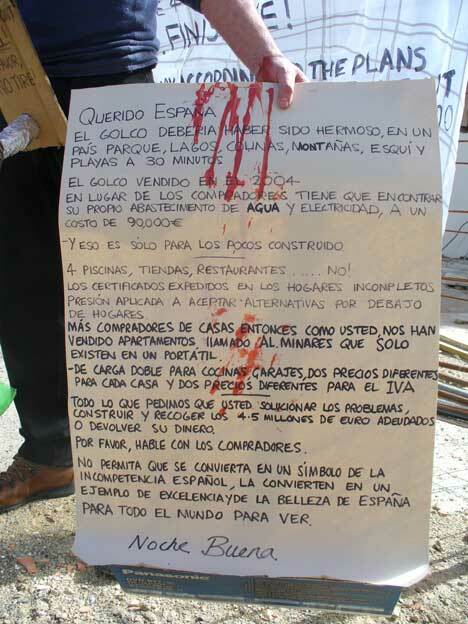 In a letter sent to the British Consulate in Málaga, which green group Ecologistas en Accion claim was “ignored,” potential buyers were told of the illegalities surrounding the development. The correspondence, signed by Javier Egea, the co-ordinator of the environmental group in Granada, asks the consulate to intervene and warn British buyers of the complex’s unsure future. But dated June 15, 2004, this letter was sent too late. By this date, many had already paid deposits. John Wilson had parted with 300,000 euros, while the likes of Martin Hewitt and Jemma Paish (see issue 38) had each given Palmera Properties 23,000 euros for their holiday apartments. ACCORDING to environmentalists Ecologistas en Accion, the complex was being erected upon the Cañada de El Golco, land protected by regional, national and European habitats laws to preserve the area’s fauna and flora. The group also alleges that no study was conducted into the impact the works would have on the surrounding environment. This is a legal requisition under Spanish law. The Junta de Andalucía claims the town hall of Alpujarra de la Sierra – a council that collectively represents the villages Mecina Bombaron, El Golco and Yegen – awarded the building licence for the development illegally. In documents seen by the Olive Press, the public works department of the regional government echoes the environmentalists in stating “there is a series of urban irregularities concerning the development.” The Junta reiterates that the land earmarked for the 17-apartment phase 4 is protected. Furthermore, as it lies outside the urban boundaries of El Golco, it would not count on being supplied by public utilities, such as electricity and water. The council claim that licenses for Zoco were only awarded with the backing of technical architects. Under spanish law all deposits should be protected by an insurance policy. Of course that costs money and evrybody tries to fiddle a bit. The result is a field day for the con men. A bit of common sense would have avoided all this heart ache. I have already dealt with late completion and compensation issues and I might be of help. This invitation to send me a message is extensive to all of you who might require protection of your rights regarding your Spanish transactions.